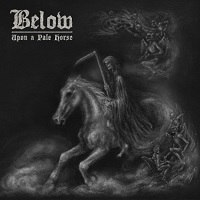 BELOW is a Doom Metal band from Sweden in the process of promoting their 2017 release, “Upon a Pale Horse,” after its immediate release and consequent inclusion in the Metal Temple, this album comes to unveil the imaginary frontier between the world of the spirit and the world of substantiality with an outrageous display of Doom Metal that brings the listener to that specific moment after waking up from a nightmare completely terrified but without any single trace or memory of what that nightmare was made of. An obscure finesse in an amalgam of bleak landscapes that seem to grow endless as the record unfolds. An amazing way to blend the voice of the lead singer with a bold and relentless pace of all the ingredients that make this band possible. “Upon a Pale Horse” is a modern example of how well Doom Metal can turn out as soon as it gets a greater quantity of Power or Thrash over the atmospheric vision that most bands expecting to thrive or at least express in this genre often look for, the spoken word and the crawling guitar riff make for a killer intro up to the time when the voice of Zeb which inevitably reminded me of a young Bruce Dickinson with a primal improvement to the tone targeted towards this obscure symphony of remembrance and oblivion. These Swedish rockers are truly masters at creating stark atmospheres into which the mind and the soul can hardly endure to sustain, as the sonic vibrations and low frequencies can place the subconscious at work bringing forth the deepest desires of the Ripper Riding Upon a Pale Horse always at our side to come harvest our existence when the inevitable comes. There is without a doubt a need for a certain amount of darkness in all of us, otherwise there would not be any dark or gloomy literature or art, as the one that has emerged from the genius of so much creative human beings who perceived the world in a more profound way just like this band does, a flawless work of creation and a better display of production skills make this record a perfect ten in the Metal Temple scale, a rare specimen brewing from darkness to show complete mastery over their craft.